It was a beautiful Spring Day here in the Pacific Northwest – and as I was cleaning up the old BBQ I knew exactly what recipe I had to make next….BEER BRATS! 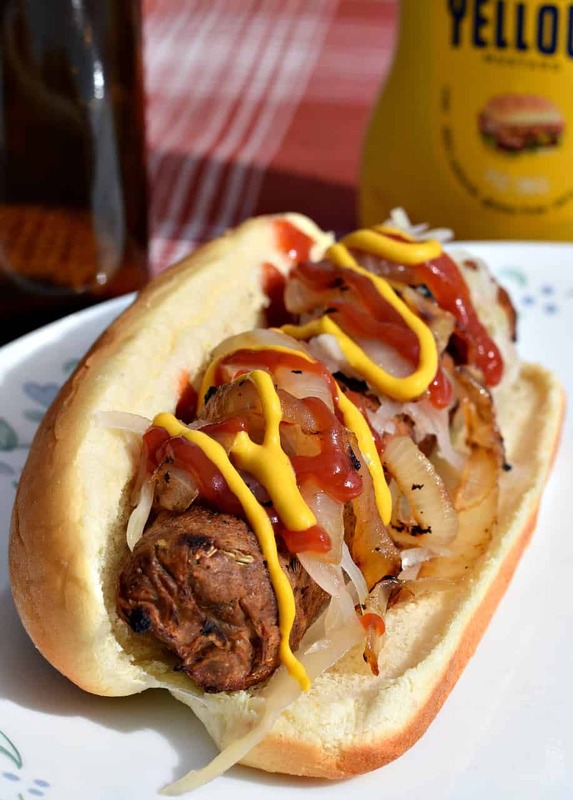 Who doesn’t love a good Beer Brat smothered with a little mustard and relish? Maybe some grilled onions and sauerkraut? Oh man…..my mouth is watering already. So get ready guys – this is one I think you’re going to really like. What….you didn’t think you’re grillin’ days were completely over now did you? 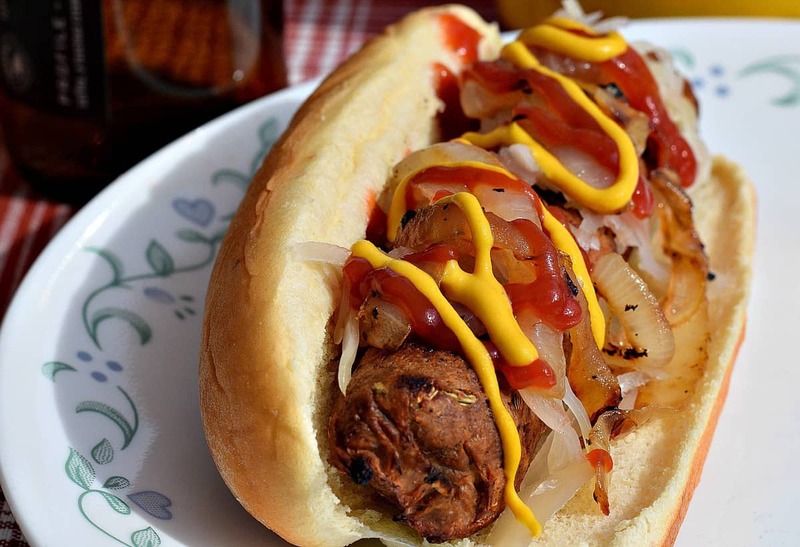 These Beer Brats are super easy to make, and with ingredients you probably already have. And the spice mixture on these in my opinion is dead on perfect. You’ll need a large bowl for the dry ingredients, a blender for the wet, and a steamer to cook your dogs in. They’re super moist and flavorful right out of the steamer, and hold up well on the old BBQ to get those perfect char marks we all love so much. You will need some Miso Paste which is now available at many grocery stores. Take a look in the “Healthy” section next to the Vegan Cheese, Tofu, Tempeh, and the like. White Miso is what I used. You’ll also need some Vital Wheat Gluten which I personally have to go to Whole Foods to find. Gluten is the protein found in wheat and is what makes your bread and pizza dough stretchy. Vital wheat gluten is just that protein in a powdered form, and although it may look like flour, it’s not – so don’t get them confused. I’ll include an Amazon Link in case you can’t find it anywhere else. Keep in mind this will be an Affiliate Link so if you do make a purchase using my links, I do make a couple of pennies on the sale. Just so you know. You won’t need a whole lot for this recipe, so be sure and seal up you bag and save it for another recipe. The prep on these homemade Beer Brats is easy. You add all the dry ingredients, including the spices – to a large bowl and whisk thoroughly. Then we’re going to add some White Cannellini Beans, Miso Paste, Soy Sauce, Liquid Smoke, and beer to your blender and mix that up until it’s nice and smooth. I used a dark Porter beer for my recipe (as that’s what I like to drink). Use whatever beer you have on hand. I couldn’t taste the beer at all in my finished Brats- so maybe one with a higher Hop content – like an IPA – will bring out some more beer flavor if that’s what you like. Now we just mix the wet ingredients into the dry until we get a wet, loose dough. Knead the dough for a few minutes (it won’t be sticky at all) and cut it into 5 equal balls. Cover those with a towel and let them rest while you prepare your steamer and get it heated up. I use my rice cooker which has a steamer basket. I just pour about an inch or two of water in the bottom and then turn it on. When you see steam coming out of the vent hole in the lid you’re ready. Cut 5 squares of Aluminum Foil and place a dough ball into each one. Stretch the dough out a bit so it kind of resembles a Beer Brat and then roll them up in the foil, twisting each end like a Tootsie Roll. Now I know some people do not like to use aluminum with their food, but we need it to retain the shape of these dogs while they’re steaming…..so simply place a small piece of parchment paper between the foil and the dogs…problem solved. Place those brats in the steamer and forget about them for 45 minutes. Now comes the hardest part – seriously. When you’re Beer Brats are done steaming – carefully remove them from the steamer and place them on a plate to cool. Now – forget about them again for another 30 minutes. Oh I know – you want to taste one NOW. And I did too – but seriously, the longer you let them rest the firmer they will become. The Brats at this stage are done – but if you’re like me and want to grill them – use this time to get your grill ready. You can also dry fry them in a pan too – whatever you like. Or eat them as they are now. It’s all good. But if you DO grill them, go ahead and get the grill ready and heating up while you wait the 30 minutes for them to rest. Note to the Men: Guys – remember these are NOT meat dogs, they are basically ‘dough’ dogs. So there is no fat that will melt and sizzle to keep these dogs juicy like a regular dog or brat. In other words: these Beer Brats will become pretty DRY if you grill them too long. So heat up the grill now – get it nice and hot – and then when it’s time – plop on the dogs just long enough to get some good grill marks and a little smokey flavor. If nothing else, have a cup of beer and a brush handy to baste your dogs while they’re grilling to keep them moist. That’s it! Vegan Beer Brats hot off the grill. These can me made ahead of time and taken to camp outs and parties for grilling later. Just toss on some French Fries and Baked Beans and you got yourself the perfect summertime picnic. Enjoy and keep those comments coming in! Get your Vegan Beer Brats! Hot off the grill. 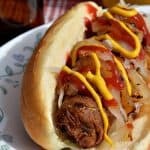 Completely fat-free these Vegan Beer Brats have amazing favor and hold up very well on the grill. Perfect for summertime BBQs! Garnish with your favorite condiments. Ketchup, Mustard, Pickle Relish, Grilled Onions, Sauerkraut. Add Baked Beans and French Fries for the perfect picnic meal! I have made similar and love the texture and flavor BUT not much a fan of gluten as my body really rebels. Do you think this would work w/ textured soy protein? Very tempted to give it a try. I made this tonite and I was very tasty. I was able to get 6 out of the batch, but I cannot eat 6 at one seating. Can these be frozen? In the foil? Thanks. I enjoy your site and recipes. I freeze them routinely. I remove foil before freezing. I used mushroom broth…and it worked great! You could also use apple beer or some other soda…like ginger ale. Could I use the steam function on my IP? If so – how long would i cook them? Sounds yummy! I made these tonight and they were wonderful! My husband really liked them. Mine took about 1-1/2 to steam though, so not sure what I did wrong, but still turned out great! I got 6 sausages out of mine as well. Any opinions on making these delicious brats earlier in the day and steaming closer to dinner time? As a Wisconsinite, I grew up on beer Brats. Bratwurst are actually one of the few meat products I genuinely miss, and while the vegan Sausages at the store are OK, they aren’t the same. This recipe looks sooooo delicious and not too difficult, either. I foresee making many of these over the summer! I made these and the texture was really soft, which I wasn’t a fan of. I live near the Herbivorous Butcher and their vegan brats have a much sturdier texture and more resistance when you bite into them. I’m not sure if I used too much liquid, didn’t steam them for long enough, or maybe needed to knead the dough a little more? If anyone has any suggestions, please let me know. I’ll post updates if I learn anything. The flavors were really great though! I spilt them down the middle and cook on grill/griddle. This eliminates the soft texture. Love them. I made these yesterday and they came out perfect in taste and texture. I used a double IPA strong beer and the taste could be detected mildly in the final product. I should have read comments: I’ll definitely make 6 or even 8 next time: could hardly finish mine, very filling. Also will spice them up. Too bad I can’t post a picture, they look great too. I just wanted to let you know that I made these over the weekend and they were a hit! We are having kind of a tough time finding meat substitutes that actually taste good and have the right texture. These were very good! I don’t use any kind of alcohol, so I used mushroom broth instead of the beer. when I try these… I might get my son to cook them in his Smoker… Has anyone else tried a Smoker? My husband made these and followed the recipe to the letter. We’ve made five other seitan recipes before and this is our favorite of all of them. Wonderfully firm, flavorful, and a good depth from the beer. This is going to be a regular at our home! Chuck, I love your recipe’s. I want to try this but the sodium in Miso Paste is a lot. Would you have any suggestions for replacing the miso paste with something else? Miso Paste is going to be hard to replace. You could TRY it without and see if it tastes ok….no guarantees though. OH MY GOODNESS!!! Chuck you nailed it!!!! I made them today and they are incredible!!!! now, can you come up with a good breakfast sausage?? I hate how the ones at the store have soooo much fat in them!! You Rock Chuck! !1 Please keep up the good work!!!! These are as easy and tasty as it says. Thank you Chuck! Another great meal! Can anyone tell me if they have had success making these with a substitute for the Vital Wheat Gluten? We have a Celiac child and cannot have such ingredients in our home. I was really hoping to make these for Father’s Day, our first one Vegan, but I am having problems with that one ingredient! Any advice would be awesome! Thank you! Gluten is a “vital” (pardon the pun) ingredient in making Seitan, such as these sausages. Sorry – I know of no other alternatives. Can you steam them in rice cooker without the steamer basket. I’ve never bought liquid smoke and Amazon has 2,000 choices 😂. Which one should I pick? I made these today and they were amazing! The seasoning blend was outstanding. My husband is from Wisconsin and thought they were just as tasty as any brat he has ever had. I followed the recipe exactly. It was very easy to follow. Thank you for such a tasty recipe! Perfect! 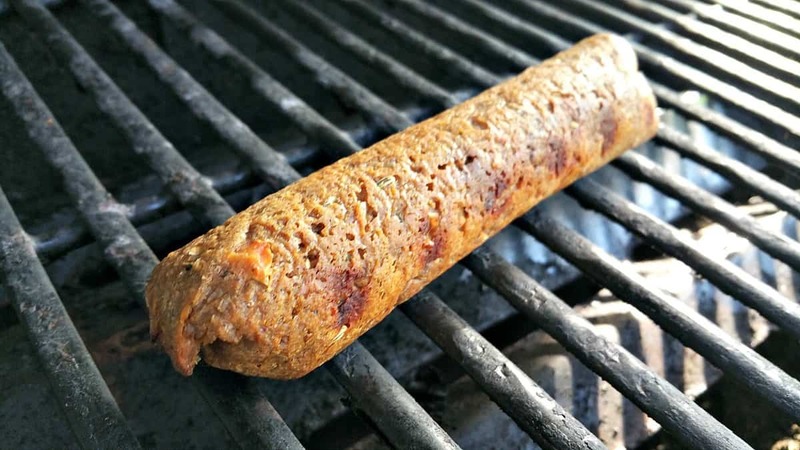 I have had a hard time finding a good vegan sausage recipe – this is definitely the best! Thank you! These are really delicious, better than any vegan sausage we have found commercially made in the grocery store. We didn’t have beer on hand so used water and it is still fine. Next time, we’ll add more spiciness.